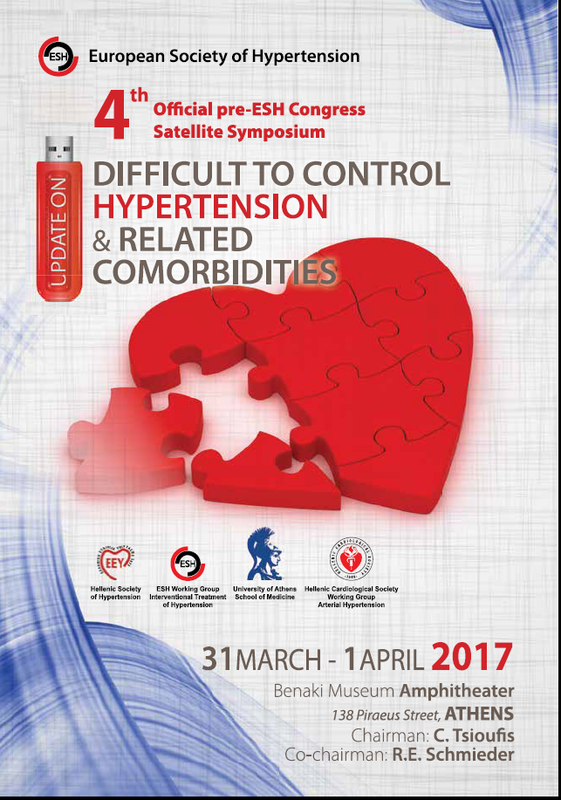 We are really very happy to welcome you again in Athens for joining us in the 4th Official pre-ESH Congress Satellite Symposium, entitled “Update on Difficult to Control Hypertension and Related Comorbidities’’, on 31 March – 1 April, 2017. Approximately 10-15% of treated hypertensives suffer from uncontrolled high blood pressure despite prescription of multidrug therapy. Difficult to control or resistant hypertension is also more common among patients with other comorbidities like chronic kidney disease, atherosclerotic cardiovascular disease, diabetes mellitus and sleep apnea syndrome. For the medical community taking care of hypertensive patients (Cardiologists, Internists, Nephrologists, General Practitioners) this Symposium aims to provide a forum of exchanging current knowledge and sharing clinical experience for the management of difficult to control hypertension. The Symposium’s sessions including round tables, debates and lively discussions have a double scope: First to help physicians to understand the complex pathophysiology and the difficulties in establishing the diagnosis of difficult to control or resistant hypertension and secondly to ensure a successful integration of therapeutic strategies for patients presenting with difficult to control hypertension. Additionally there is a workshop on hypertension and Stroke with special emphasis on current therapeutic new options. Having the above in mind, we are excited to share with you the final scientific program and the knowledge of international experts as a foretaste of the main meeting of the ESH 2017.